Information you want to share? Every 3rd Thursday from May to September! 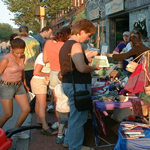 3rd Thursday Street Fests offer you a wonderful opportunity to showcase your products, at a very low fee. Our mission includes promoting area artisans, crafters, small and home businesses. The Fests provide interactive exposure to a large audience of between 5-8,000 people each month. Our previous 15 seasons have been resounding successes which bring together art, culture, commerce and community in downtown Willimantic. 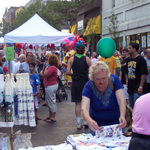 Please note that the Willimantic Police Department requires any one selling items, be they vendors or entertainers, to buy a licence with background check at the Police Department. Willimantic Renaissance, Inc. and the 3rd Thursday Street Fests are dedicated to representing and including our entire diverse community in all our endeavors. Vendor location preference will be given to local and seasonal vendors. The Street Fests are run by volunteers, so we appreciate your consideration in registering 2 weeks ahead and paying at least one week prior to the Fest. Are you an entertainer or vendor? Entertainer - band, singer, dancer, street performer, etc. Vendor - goods, services, food, advertising, non-profit, etc. If you have signed up for the fest in a perious month or year, please enter the email address you used to sign up with.